USA Hostels San Diego v San Diego, USA: Zarezervujte nyní! NOTE! NO Group bookings from 1st June to 30th September. We do not accept groups in these periods, and the booking will be cancelled. In addition to the payment made to Hostelworld (which is a fee they keep and is not paid to the hostel), USA Hostels requires one night’s payment within 10 days of the booking being confirmed. If arrival is within 14 days of this booking being made, then deposit is due immediately. For groups staying more than one night, balance is due 10 days prior to arrival. If payment is not received prior to arrival, reservation is subject to cancellation with no refund of either the deposit to Hosteworld or the first night’s stay paid to USA Hostels. Booking this reservation assumes the guest agrees to USA Hostels automatically charging the credit card on file for one night’s stay for each group member upon receipt of the booking and charging the remainder of the stay to the credit card on file 10 days prior to arrival. Cancellations and reductions in numbers of guests can be made without penalty up until 10 days prior to scheduled arrival. The USA Hostels’ one night deposit will be kept for cancellations/reductions that occur from 9 days to 73 hours prior to scheduled arrival date. The entire amount due will be kept for cancellations/reductions within 72 hours of arrival due date or for no shows on date of arrival. All cancellation and/or reduction requests must be submitted in writing through the Group Reservations Department of USA Hostels (not Hostelworld). NOTE! NO Group bookings from 1st June to 30th September. We do not accept groups in these periods, and your booking will be cancelled. Exclusive use of dorm rooms is only guaranteed if the group reserves an entire 4 or 6-bed dorm. Groups using only a partial room will need to pay for the empty beds if they wish exclusive use of the room. Otherwise, the unused beds will be sold by the hostel to individual travellers. The credit card on file will also be charged in the event of the following: A. late checkout without previous arrangement ($10 per guest until 11 am - full daily charge per guest after 11 am) B. dorm keys, sheets or towels not returned ($10 per missing item), C. damages to the guest rooms occupied by the group or to any hostel property by members of the group (on site management will assess the cost of repair or replacement), D. any hostel, tour, etc payments due from any member of the group and not paid by checkout. USA Hostels reserves the right to inspect the guest rooms after checkout and group will be notified within 3 days of checkout if any damages are found or if any payments are due. Groups staying more than 3 days must restrict the amount of food they store in the kitchen to no more than 3 days worth of food due to kitchen storage restrictions. Unopened food and drink may be kept in the rooms, but ALL open food or drink items must be kept in the kitchen. Open food or drink found in rooms will be subject to a forfeiture of the security deposit. Group must not take more than 1/3 of the cooking space in the kitchen when preparing meals so that other guests may also have access to the facilities. Please note, this hostel does not accept guests under the age of 18. If any member of the group is younger than 18, it is management’s discretion to accept or deny lodging. NO Group bookings from 1st June to 30th September. We do not accept groups in these periods, and the booking will be cancelled. USA Hostels San Diego is a colourful and funky hostel location in the central Gaslamp District of the city. This hostel features all-you-can-eat pancake breakfasts, power sockets in their large lockers, pub crawls and budget-friendly dinners. Each bed has a privacy divider, a personal light, a shelf and a power socket. Hostelworld guests say the 'great fun and very approachable' staff 'know what they're talking about' when it comes to local sights and have highly recommended this hostel 'if you're looking for an inexpensive place to crash and meet interesting people'. We like their day trips to Tijuana. Rated a top hostel in San Diego on Hostelworld, Trip Advisor and other sites, we've been hosting savvy travelers for more than 22 years! Our fun environment, exclusive ‘privacy pods’ and central Gaslamp Entertainment District location makes us a great spot to hang out while visiting this great city. And now we've central air conditioning in rooms and all new bathrooms, offering a great way to cool down and relax after a long day of sightseeing or before heading out with us for a pub crawl or nighttime activity. USA Hostels San Diego has the best value for your $$ with privacy pods that feature a reading light, shelf and outlet, and of course, privacy screening; free wifi and heaps of other amenities. And, no other hostel can show you the city like us! Join us for Tuesday Taco nights, head out on the town for a club crawl, or hop on our daily shuttle that will take you to the Zoo, SeaWorld or the beach! Please refer to check-in requirements at the bottom of this page before making a booking. Please note: Taxes are not included in listed prices. All bed rates over $25 have an 10.5% city/hotel tax added at check in. We welcome guests from everywhere outside of San Diego county. At check in, international guests must present a valid passport. US residents must present valid government issued identification (ie: drivers license, state id card, passport). Guests may also be asked to present proof of onward travel. I think that what makes us truly unique is that we're set in a historic 1880s building in the heart of the Gaslamp entertainment district in downtown San Diego. 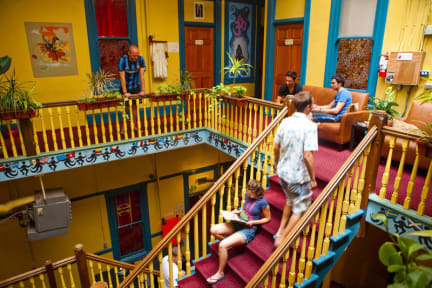 Having been both a brothel and a children's home and purported to be haunted, the hostel's colourful combination of eclectic artwork and Victorian architecture mixed with Mexican elements makes it unlike any other hostel in the city. The location of the hostel can't be beat; all the entertainment is right outside the door. Also convenient and appreciated is that many other tourist attractions are walking distance from the hostel, including the Midway Museum, Seaport Village, Balboa Park and the world-famous San Diego Zoo. Personally, I'd say the zoo is the place not to be missed, as it's unlike most of the zoos in the world. In addition to its size, animals are housed in natural settings. Zoo admission helps this non-profit's efforts to save and repopulate endangered species.